VIENNA, Austria -- After a terrible 2009, Ukraine's economy will grow 5 percent this year, higher than earlier government predictions, and then another 5 to 10 percent in 2011, Prime Minister Mykola Azarov said in an interview. PM Azarov attending a session during the Vienna Economic Forum on Monday. "The growth in GDP will be about 5 percent this year. Next year the minimal growth we see is 5 percent. 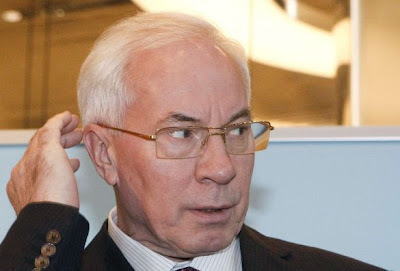 At maximum, we'd get to around 10 percent," Azarov told Reuters in an interview Monday during a visit to Vienna. The world financial crisis hit Ukraine especially hard, knocking 15 percent off its gross domestic product in 2009 after eight years of growth averaging 7.5 percent. Its currency has lost about 40 percent against the dollar over the past two years. The International Monetary Fund forecasts Ukraine's growth at 3.7 percent this year and 4.5 percent next year. "We planned on 3.4; it turned out to be 5, so we significantly reduced our budget deficit," Azarov said. He said earlier government estimates were deliberately conservative to avoid raising the budget deficit based on unrealistic hopes. Ukraine is targeting a deficit of 5 percent of GDP this year. "The worst period is already over, and we are exiting from the crisis," the prime minister said. "We need reforms, but we also need very cautious, conservative policies from the government, under which credits coming to us are used only for the development and modernization of energy supplies, on those tasks that would enable us to have fast economic growth." In August, Ukraine obtained a $15 billion credit line from the IMF under which the government announced austerity measures that include a 50 percent rise in what households pay for gas. "We have achieved a level of financial stability under which we can obtain as much money on markets as we need," the prime minister said. "We will go to markets when we need to achieve our goals, development above all." Another factor hitting Ukraine's economy this year is a poor grain harvest, which is likely to fall to about 38 million metric tons from 46 million tons in 2009. Asked about the 2011 harvest prospects, Azarov said: "If we have good weather, we'll have a good harvest and we won't have any quotas. But if it repeats, we will face a dilemma: either export grain and remain without grain, or set the quotas that assure the country's security. So naturally we will follow our national interests." Ukrainian grain export quotas took effect Oct. 19, and the government said the limits aimed to prevent a sharp jump in domestic prices after a severe drought reduced the 2010 harvest and neighboring Russia barred exports altogether. Ukraine is one of the top global exporters of wheat and barley. Regarding changes in the country's pension system, under which women can retire at age 55 and men at 60, Azarov said it would not suffice just to make people wait additional years to receive their benefits. "We are already lowering the deficit of the pension fund under a whole series of mechanisms," he said, adding that the country wanted to create a European-style system under which individual contributions are linked to the eventual payout. "In the next stage we would look at raising the age," he said. "But you need to keep in mind that the average mortality rate in Ukraine is lower than European counties, so we need to first raise life longevity, then raise the pension age." According to the memorandum agreed upon with the IMF this year, Ukraine was going to consider gradually raising the retirement age for women to 60 years, but this idea has been met with strong public criticism.